When he’s not documenting the joy and pain of football for Setanta Sports (video above) Scroobius Pip’s busy organising a bi-weekly FREE spoken word and acoustic music night at Pure Groove Records. You can grab the FREE podcast for the first Satin Lizard Lounge via itunes or directly here (right-click target as etc). Enjoy!!! First up we have Poeticat. 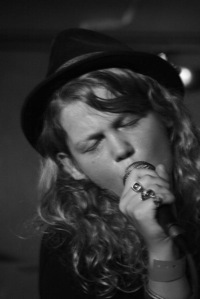 Poeticat has been playing gigs all round the UK and the festival scene for afew years now. With deep, heartfelt tales and stories she will have the crowd enraptured from start to finish. Next up we have Excentral Tempest. Now, anyone on the spoken owrd scene/circuit will know just how good Excentral Tempest is. Generally considered to be at the top of the spoken word mountain right now, Tempest will fill her stage time with so much knowledge and intensity you may need to cool off once she leaves the stage. Not to be missed. Also check out her band Sound of Rum who a very good indeed as well. Finally Peggy Sue provide the musical section of the night! Having just made a huge impact at SXSW before recording their new album in New York, this stripped down, intimate set will be the bestest i swear!